Foldable and compact design, convenient to set it up for small products and still life photography. Made of PP material, very durable, lightweight and portable, it will work excellent everywhere and anytime. 20pcs high brightness light beads on the LED strip, with 6500K color temperature and 550LM max. brightness, can provide enough light source for shooting professional pictures. 5V, 1A USB port on the LED strip can connect to laptop, AC adapter or power bank to supply power by using the included USB cable. 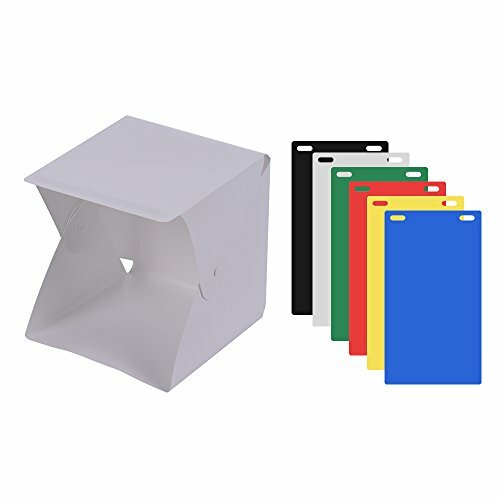 6 different colors (Black, blue, green, red, white, yellow) of backgrounds are included to meet shooting demands on various types of small products. The studio product must be connected with 5V 1A output external power before use. It may cause fatal damage to the LED light chips once using improper external power.